Eighteen white-clad bodies hurl themselves across the raised mat in the Green Valley Kodokan, punctuating the air with grunts as they slap the mat. It’s organized chaos as row after row of children—ages 5 to 14—cross the mat and somehow manage not to collide. Supervising the scene is the sensei—or instructor—Milind Dhond, M.D., NorthBay Healthcare’s Medical Director of Peripheral Vascular Program. Tonight, the respected cardiologist is all business as he walks along the edge of the mat, observing his students in action as they demonstrate their jujutsu skills. His wife, Teresa Whitley, M.D., is among the crowd of parents tonight who have assembled on benches that line the small dojo, or school. The families are eager, for many of the students will be promoted—graduating from one color belt to another. Dr. Whitley, an internist with the NorthBay Center for Women’s Health, is often part of the action, demonstrating moves and falls with her husband, although she is pleased that one of the older students has stepped up to demonstrate in recent months. Tonight, she holds a video camera in her hands, ready to capture special moments. Jujutsu is the collective name for Japanese martial art styles, which evolved among the samurai of feudal Japan and was used for defeating an armed or armored foe—with or without the aid of weapons. Dr. Dhond began as a student in Sacramento when he was in his 20s and picked it up again in his 30s in Reno. By 2003, he was a black belt. He realized it was a skill he could share with his wife and three young children. That, in turn, led the couple to begin classes. 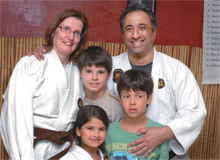 Dr. Dhond teaches one to two children’s classes and two to three adult classes each week. The children break up into smaller groups, the white belts working with other white belts, the orange belts banding together, and so on. Adult students who have offered to help out team up with the groups of children and help them walk through their exercises. “This is not like stepping into any other place,” the sensei warns them. “You must be aware of everything and everyone around you. If you aren’t, you’ll do 100 pushups,” he tosses in, casually. Dr. Whitley, a brown belt, admits that life does get crazy in a household with two busy doctors’ schedules, three young children, school, jujutsu classes and soccer practices each week. But it’s clear the children love it. 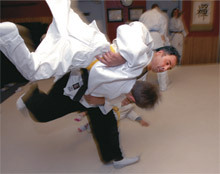 They demonstrate their moves with confidence, and are quick to help other children on the mat. He mentions each child by name and talks in depth about their skill, their commitment and areas in which they can grow. Then he leads a team bow and moves on to the next group. Of course after class, there’s pizza and celebration, with the Dhond-Whitley crew leading the charge. Be aware of your level of fitness before embarking on physical activities. Speak to your instructor about your goals and current level of fitness.